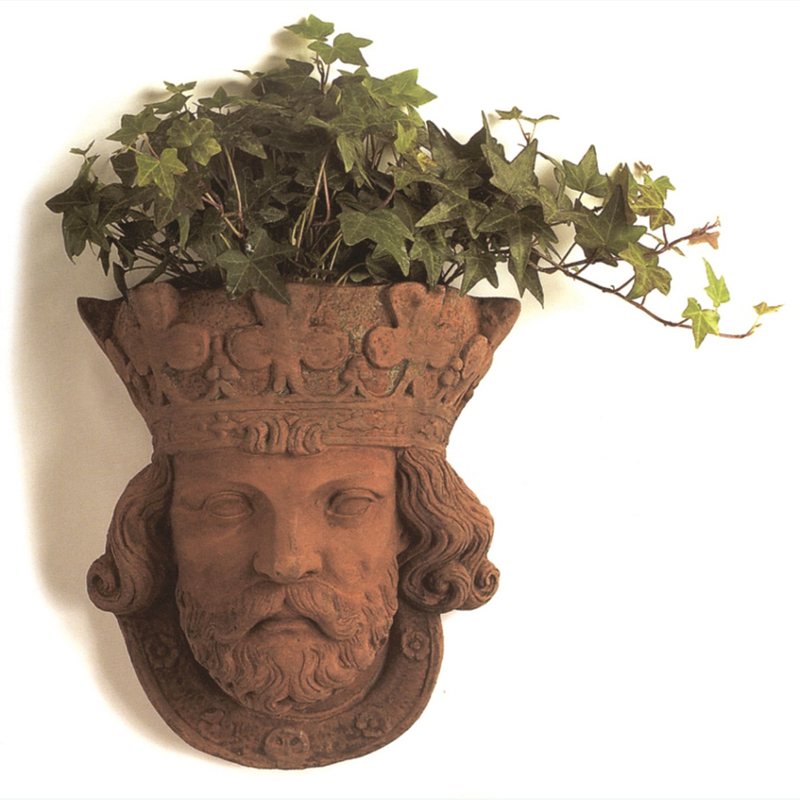 Terracotta Neptune mask wall planter. If you would like more information about any or our products or services please fill in the form below. We will aim to get back to you within 24hrs however during busy periods this may take a little longer. 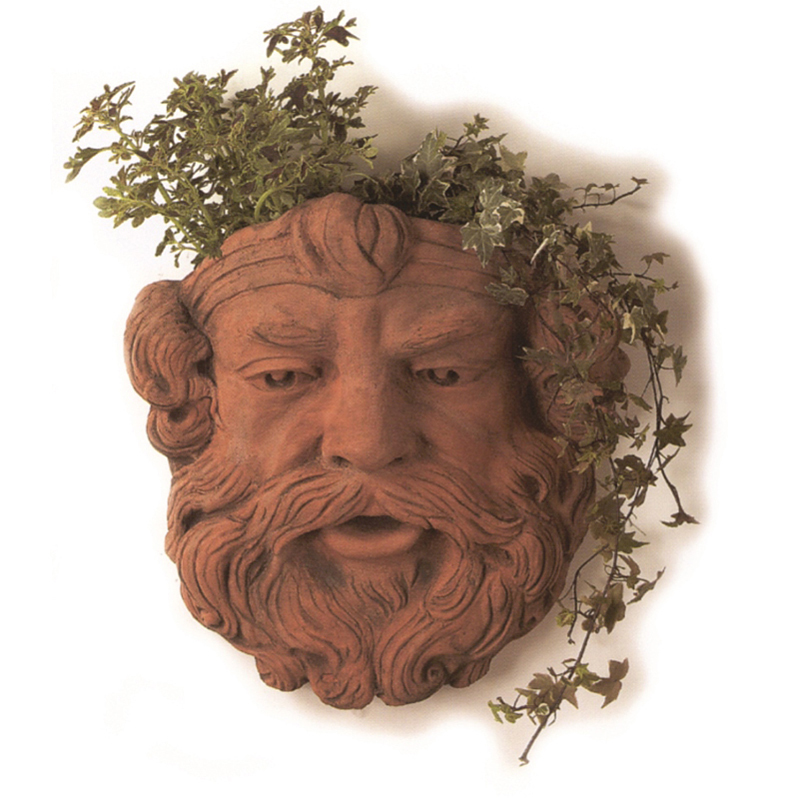 Authentic antiqued terracotta finish Neptune mask wall planter. Planter has 2 holes in the back, one for hanging & one for drainage. Designed & Made in England. Manufactured from carefully selected materials to ensure weather & frost proof durability. 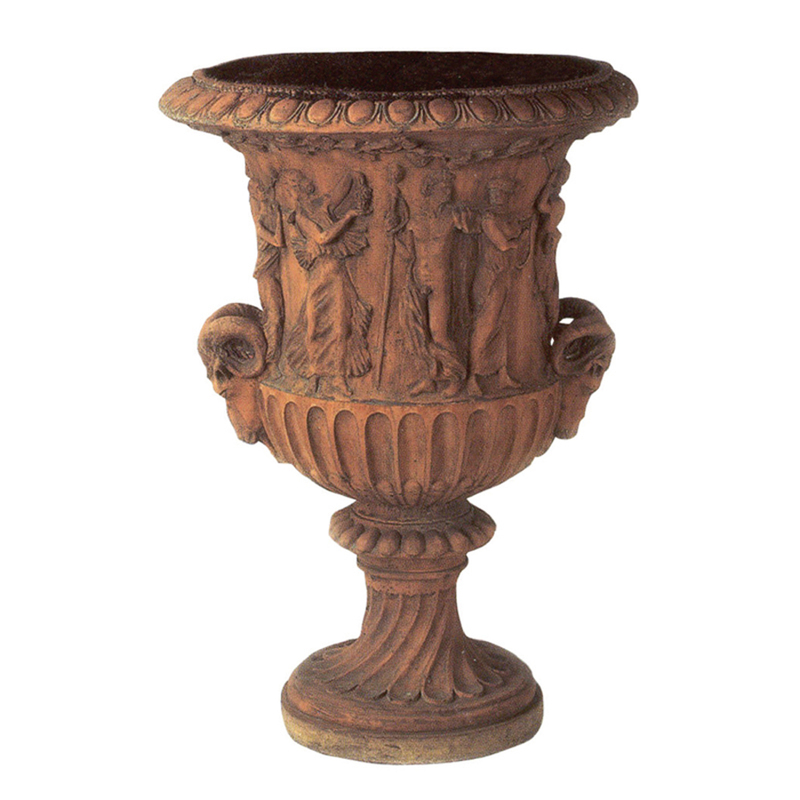 Authentic antique terracotta finish Adam urn. Designed & Made in England. Manufactured from carefully selected materials to ensure weather & frost proof durability. 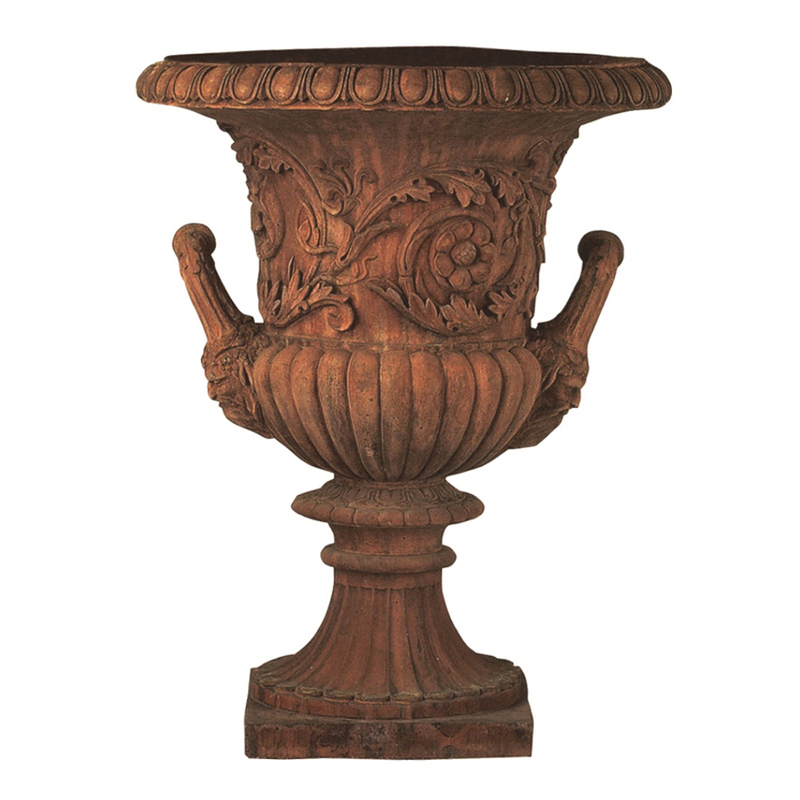 Authentic antique terracotta finish Windsor urn. Designed & Made in England. Manufactured from carefully selected materials to ensure weather & frost proof durability. 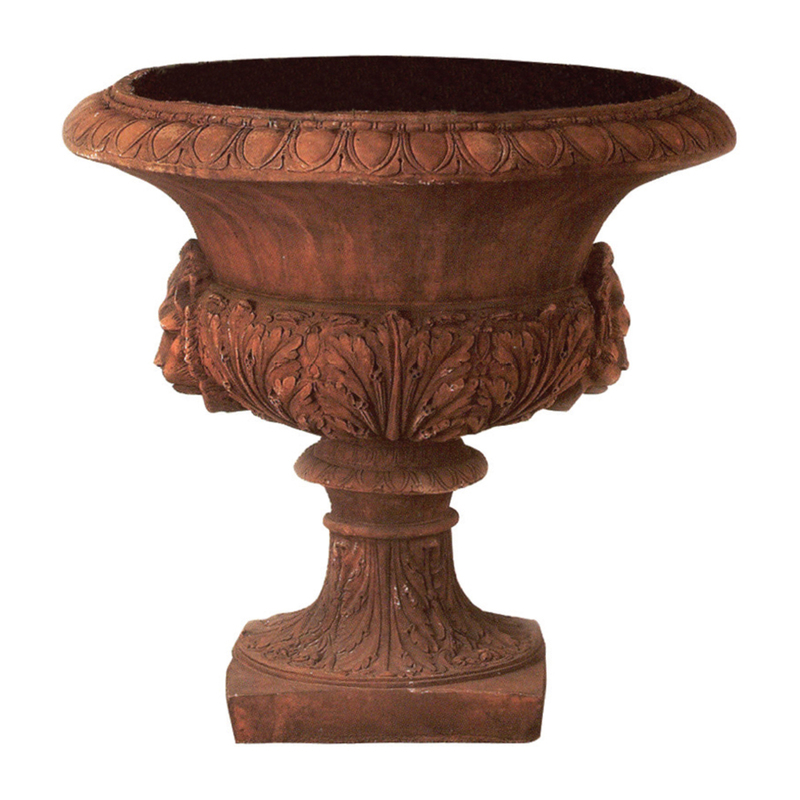 Authentic antique terracotta finish Acanthus leaf urn. Designed & Made in England. Manufactured from carefully selected materials to ensure weather & frost proof durability. 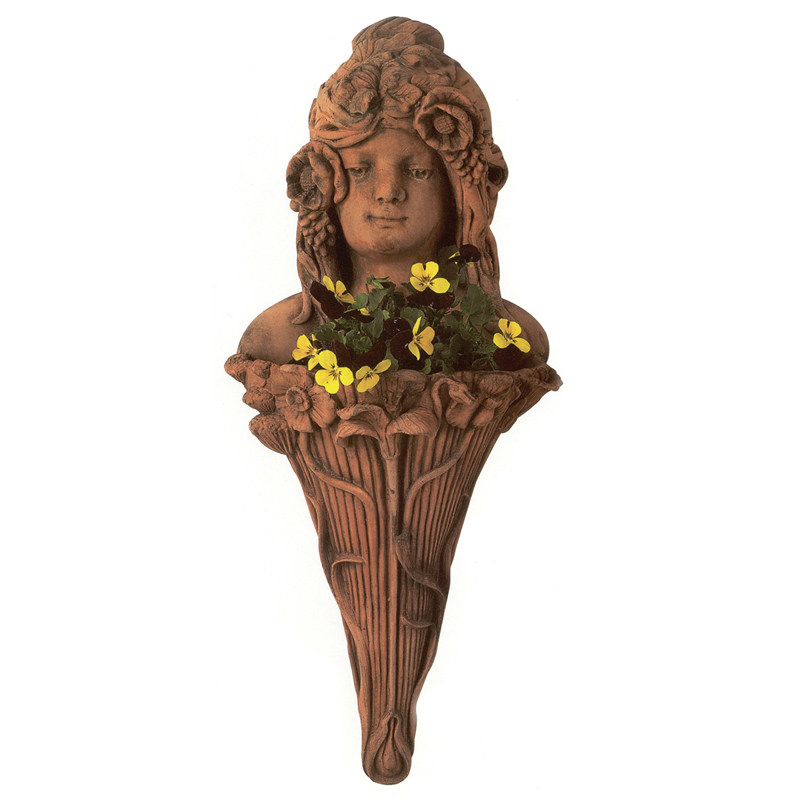 Terracotta Art Nouveau fluted stem wall planter. 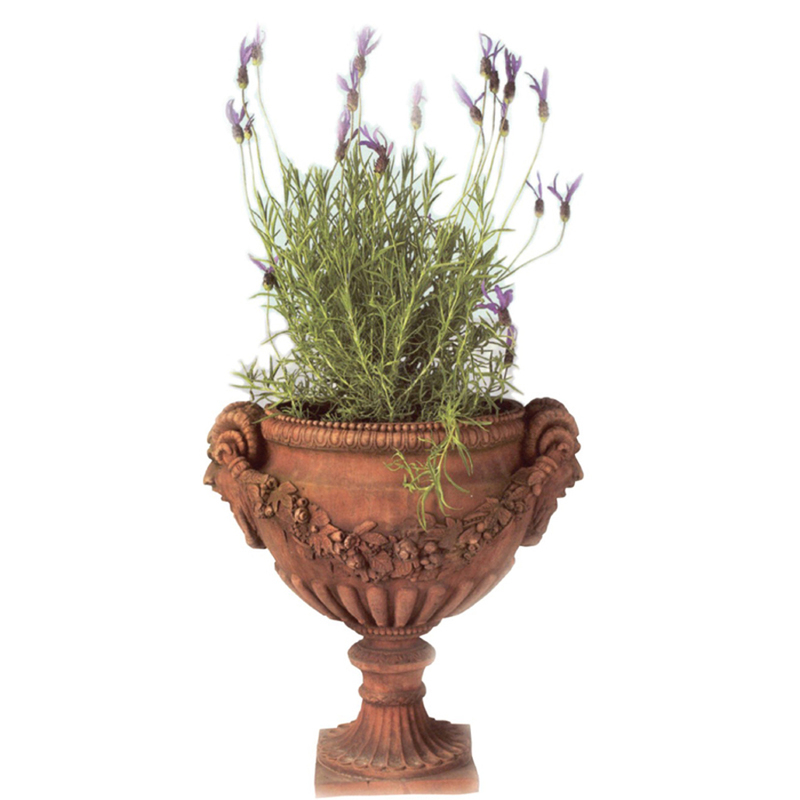 Authentic antiqued terracotta finish Art Nouveau fluted stem wall planter. Planter has 2 holes in the back, one for hanging & one for drainage. Designed & Made in England. Manufactured from carefully selected materials to ensure weather & frost proof durability. 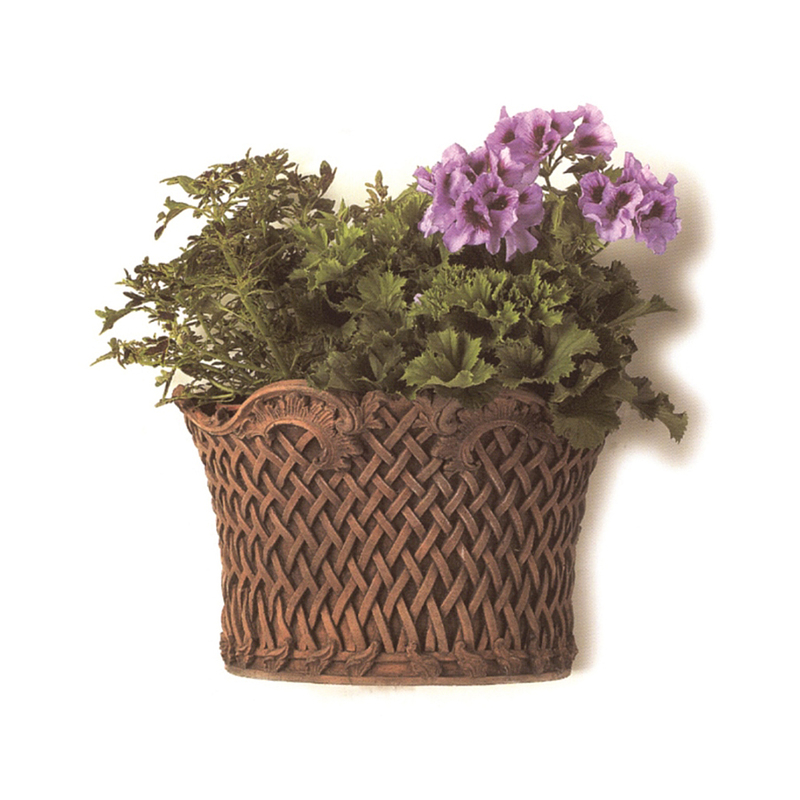 Terracotta Basket weave flower planter. 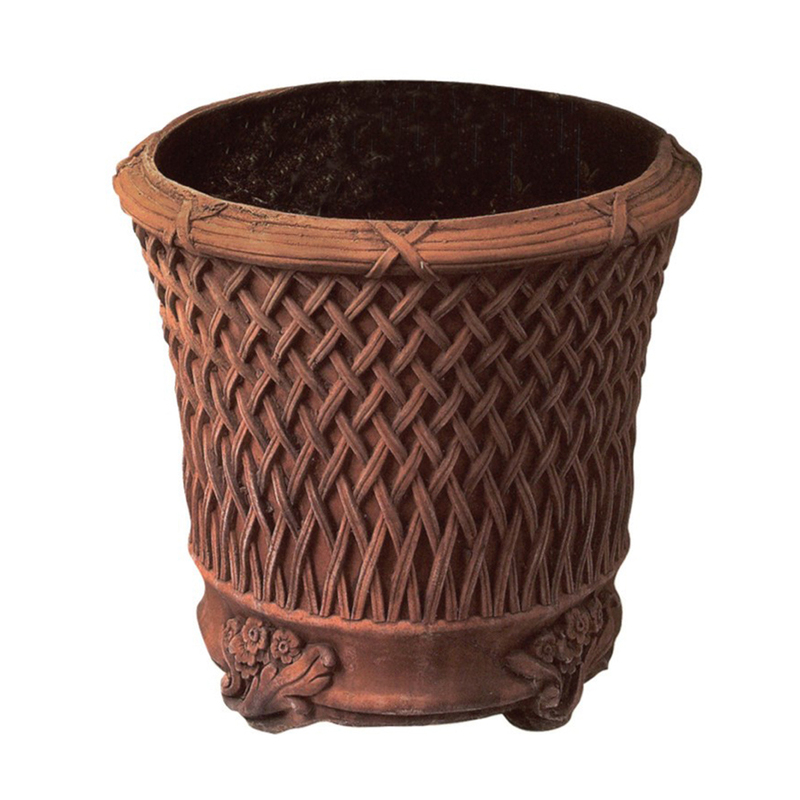 Authentic antiqued terracotta finish basket weave flower planter. Planter has a drainage hole. Designed & Made in England. Manufactured from carefully selected materials to ensure weather & frost proof durability. 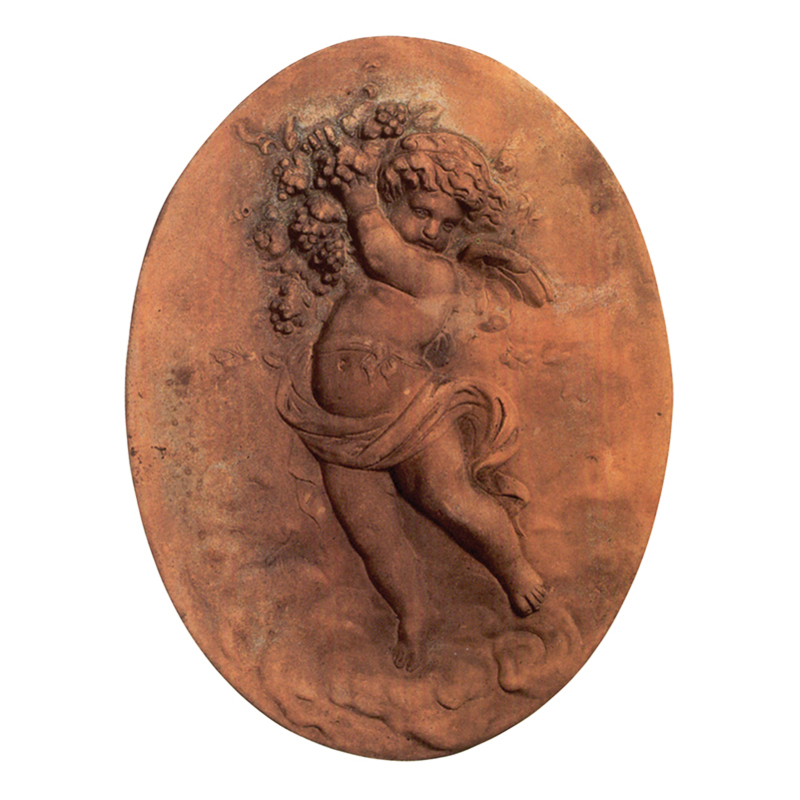 Authentic antiqued terracotta finish Cherub holding fruit bowl wall planter. Planter has 2 holes in the back, one for hanging & one for drainage. Designed & Made in England. Manufactured from carefully selected materials to ensure weather & frost proof durability. 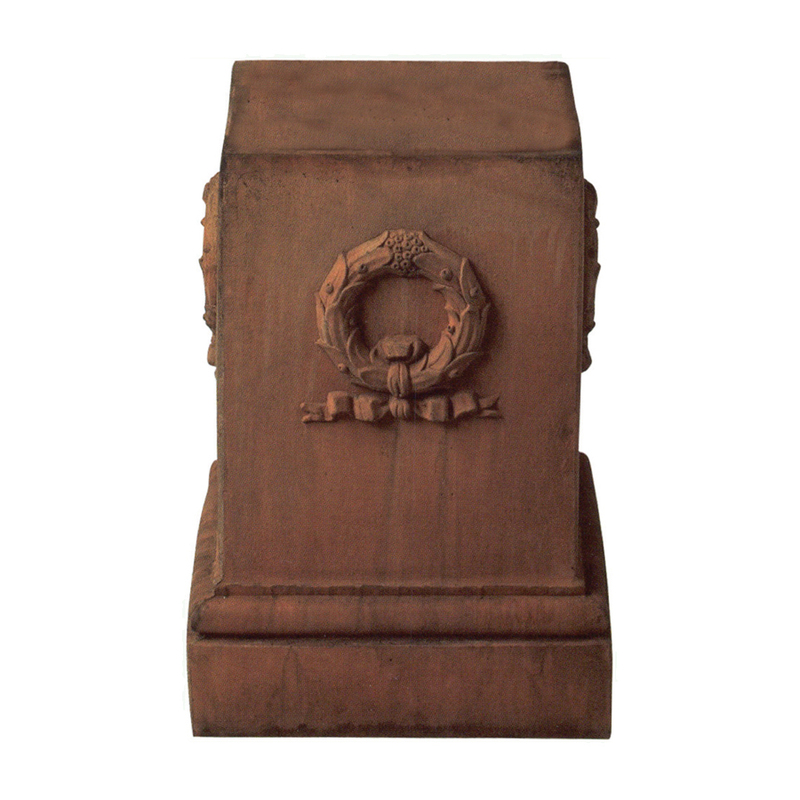 Authentic antique terracotta finish Georgian Urn. Designed & Made in England. Manufactured from carefully selected materials to ensure weather & frost proof durability. 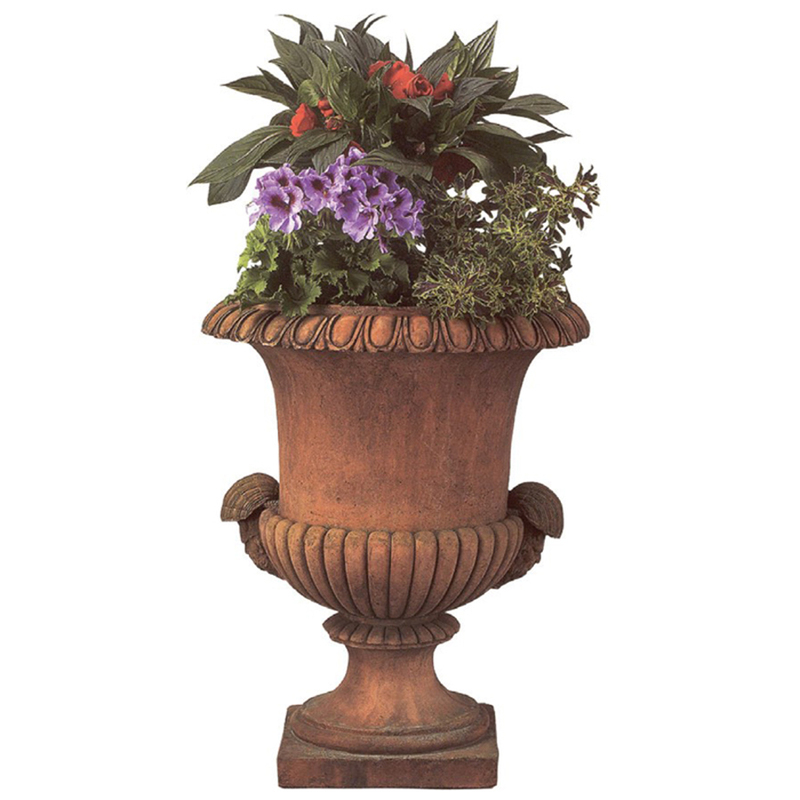 Authentic antique terracotta finish Georgian pedestal (shown with Victorian Tazza urn OST18T). Designed & Made in England. Manufactured from carefully selected materials to ensure weather & frost proof durability. 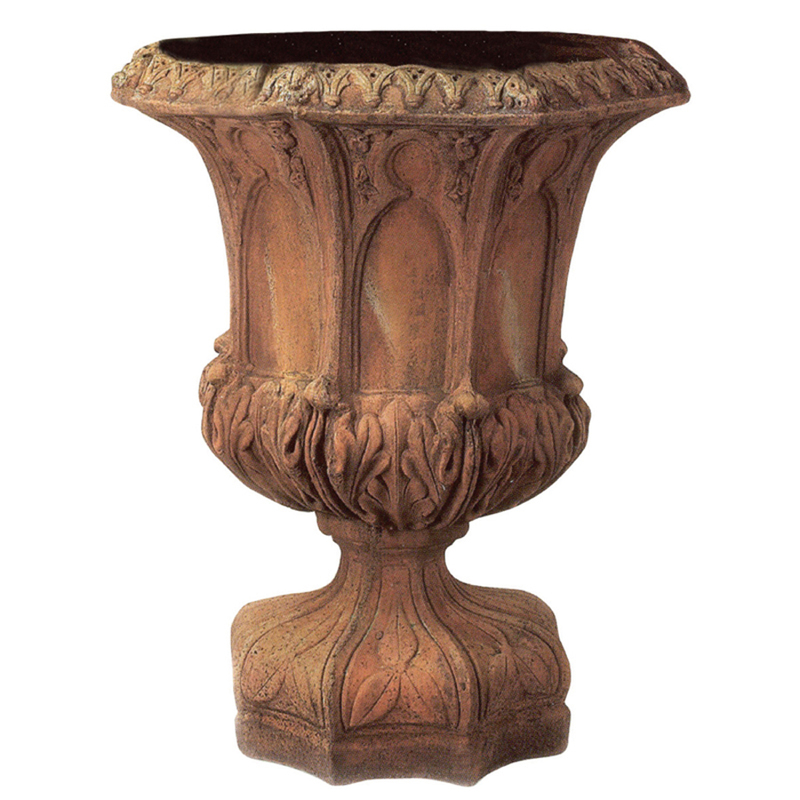 Authentic antique terracotta finish Gothic urn. Designed & Made in England. Manufactured from carefully selected materials to ensure weather & frost proof durability. 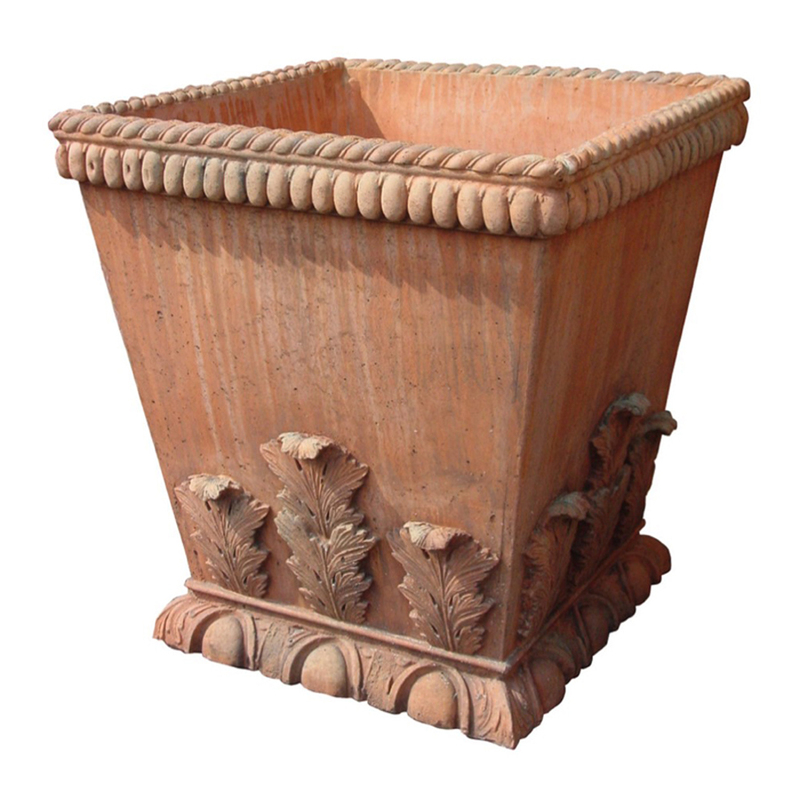 Authentic antiqued terracotta finish king wall planter. Planter has 2 holes in the back, one for hanging & one for drainage. Designed & Made in England. Manufactured from carefully selected materials to ensure weather & frost proof durability. Authentic antique terracotta finish Leo vase. Designed & Made in England. Manufactured from carefully selected materials to ensure weather & frost proof durability. 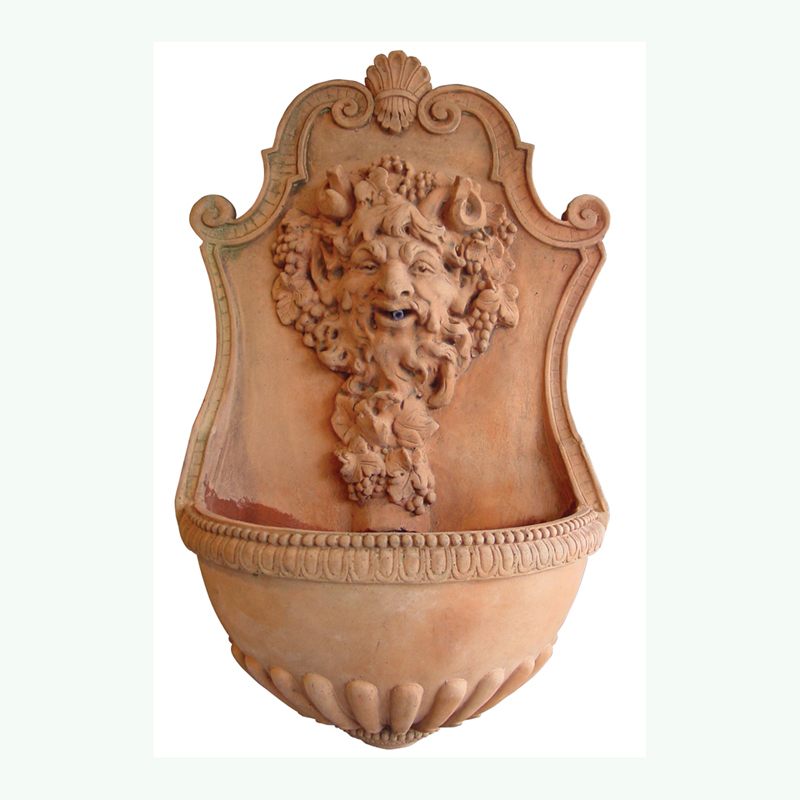 Authentic antiqued terracotta finish Satyr mask wall fountain head. A galvanized hook is set in the back for hanging. Designed & Made in England. Manufactured from carefully selected materials to ensure weather & frost proof durability. 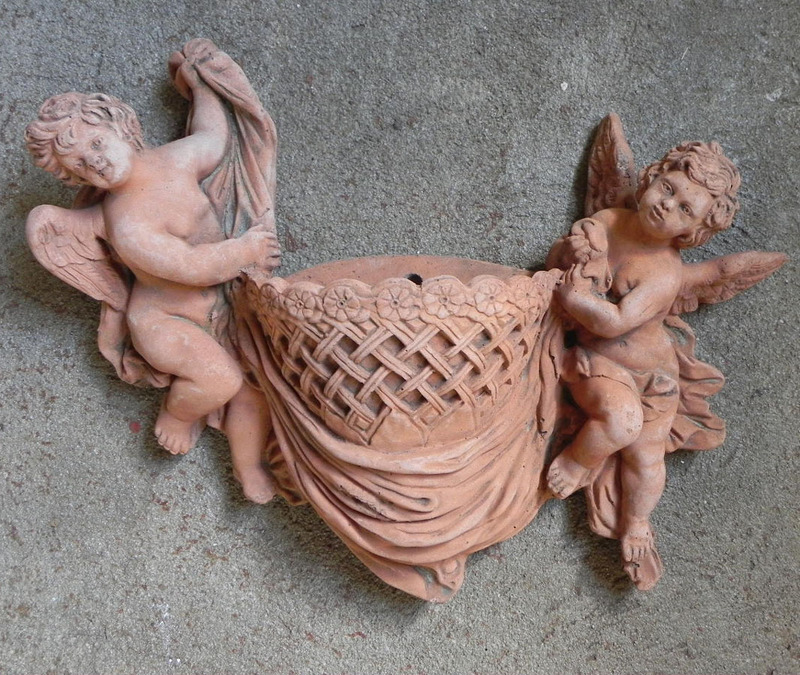 Terracotta Twin cherub & basket wall planter. 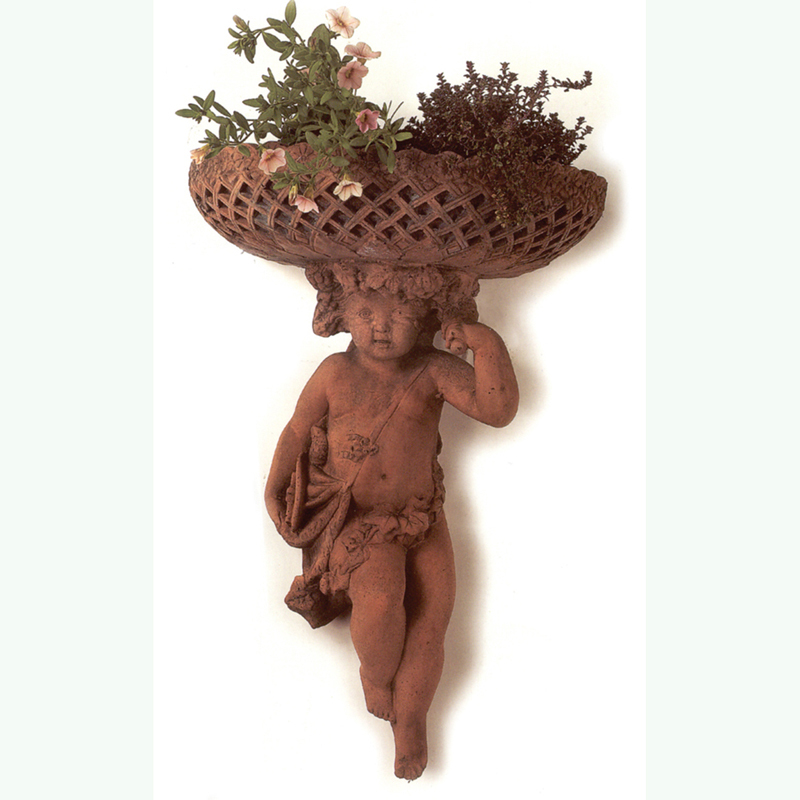 Terracotta finish Twin cherub & basket wall planter (finish shown not available). Planter has 2 holes in the back, one for hanging & one for drainage. Designed & Made in England. Manufactured from carefully selected materials to ensure weather & frost proof durability. 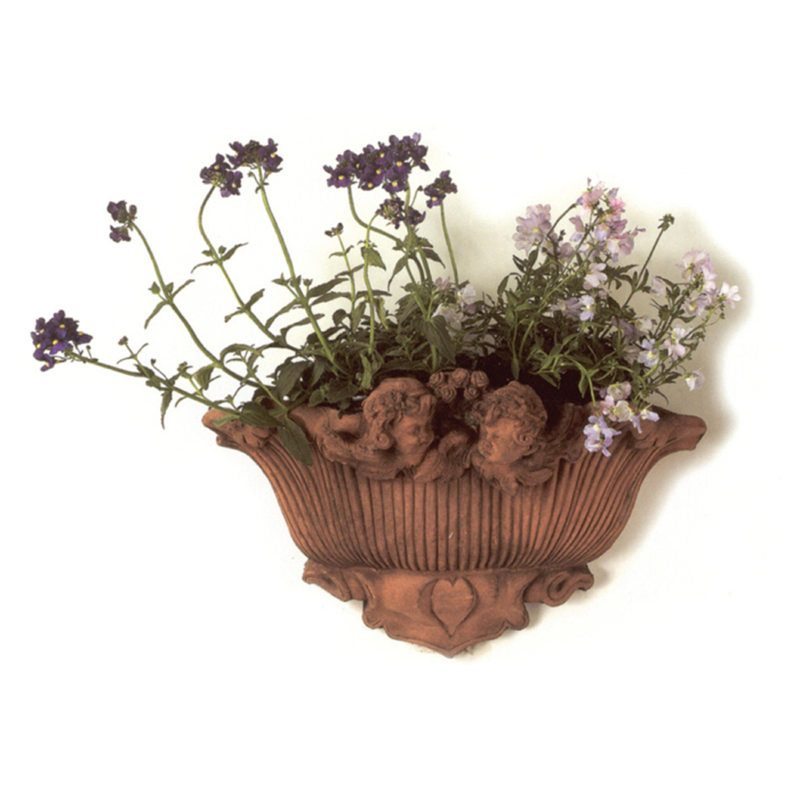 Authentic antiqued terracotta finish Valentine wall planter. Planter has 2 holes in the back, one for hanging & one for drainage. Designed & Made in England. Manufactured from carefully selected materials to ensure weather & frost proof durability. 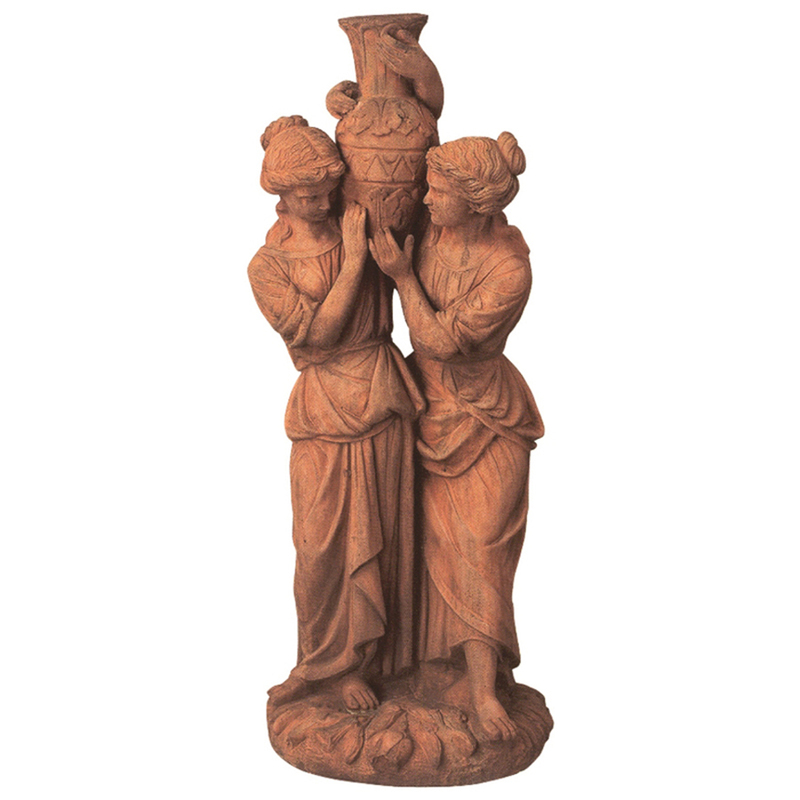 Authentic antique terracotta finish Victorian Ladies Statue fountain head. Designed & Made in England. Manufactured from carefully selected materials to ensure weather & frost proof durability. 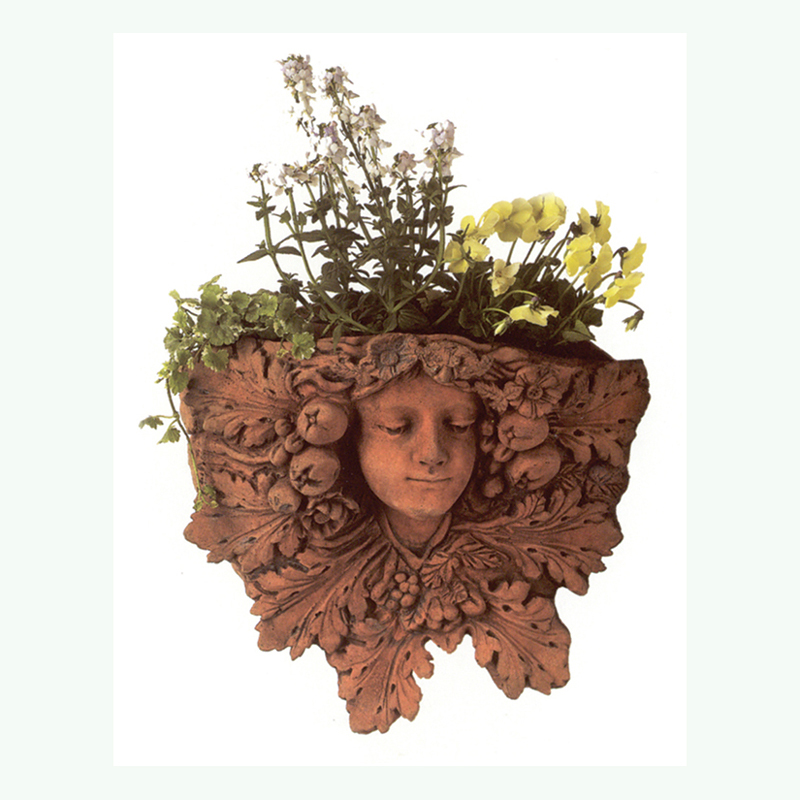 Authentic antiqued terracotta finish art nouveau lady planter, left hand. (Right hand also available OM53T-RH). Planter has 2 holes in the back, one for hanging & one for drainage. Designed & Made in England. Manufactured from carefully selected materials to ensure weather & frost proof durability. 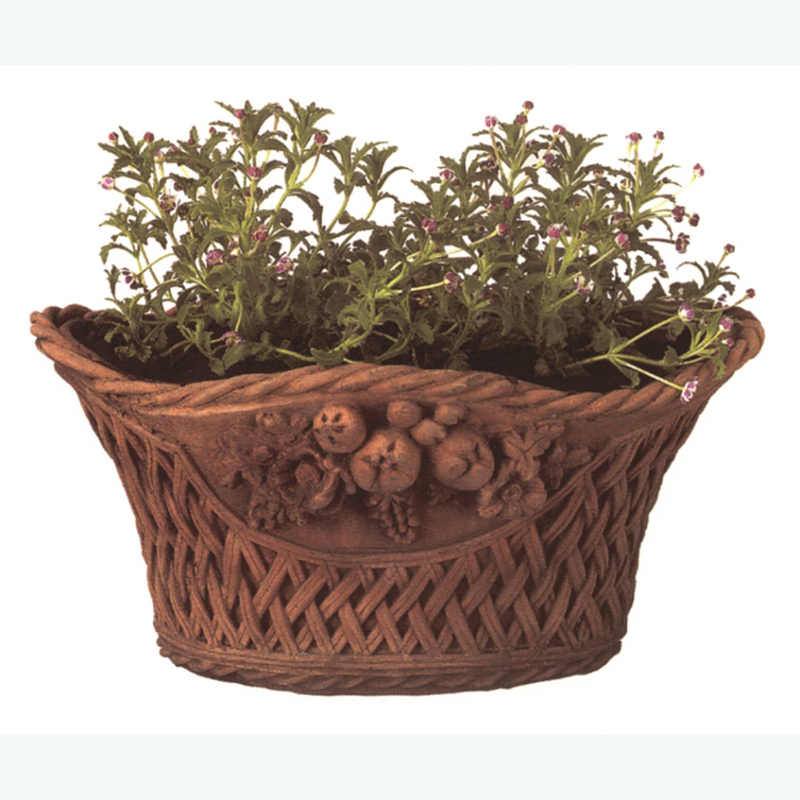 Authentic antiqued terracotta finish basket weave flower planter. Has drainage hole in the bottom of planter. Designed & Made in England. Manufactured from carefully selected materials to ensure weather & frost proof durability. 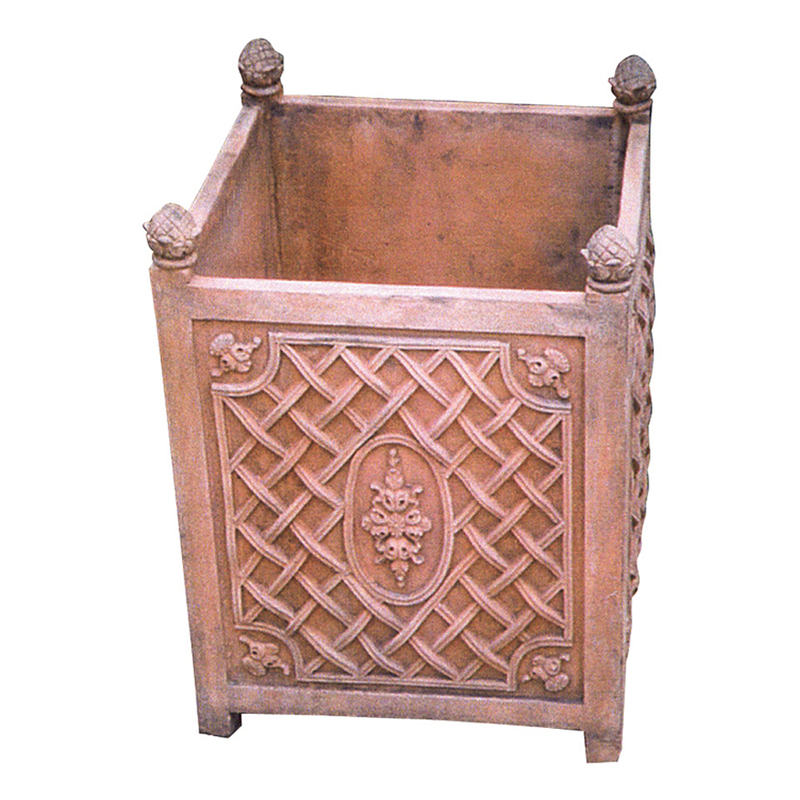 Authentic antiqued terracotta finish basket weave wall planter.. Planter has 2 holes in the back, one for hanging & one for drainage. Designed & Made in England. Manufactured from carefully selected materials to ensure weather & frost proof durability. 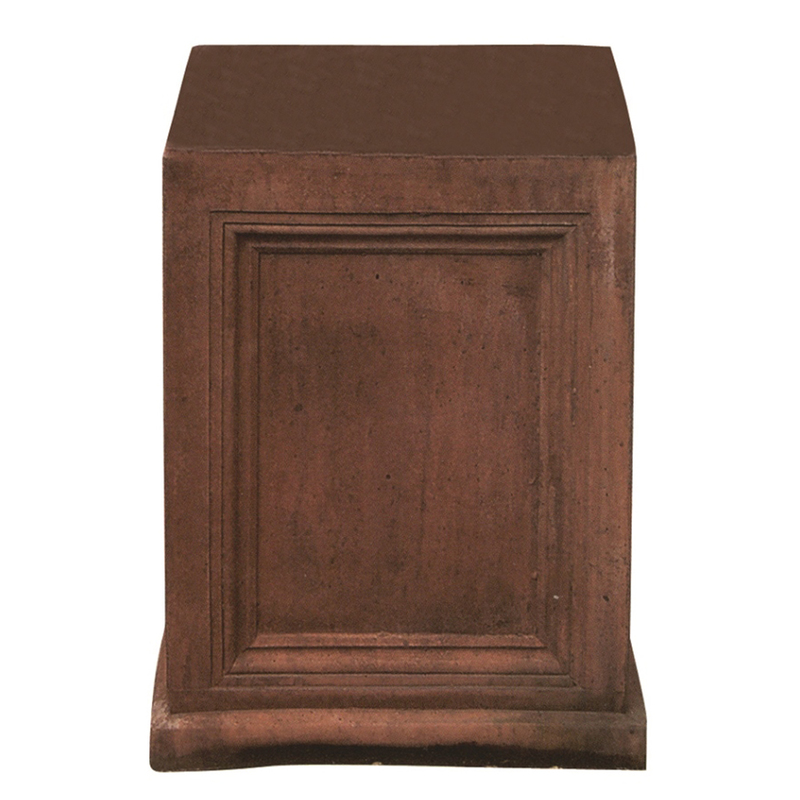 Authentic antique terracotta finish blashfield pedestal. Designed & Made in England. Manufactured from carefully selected materials to ensure weather & frost proof durability. 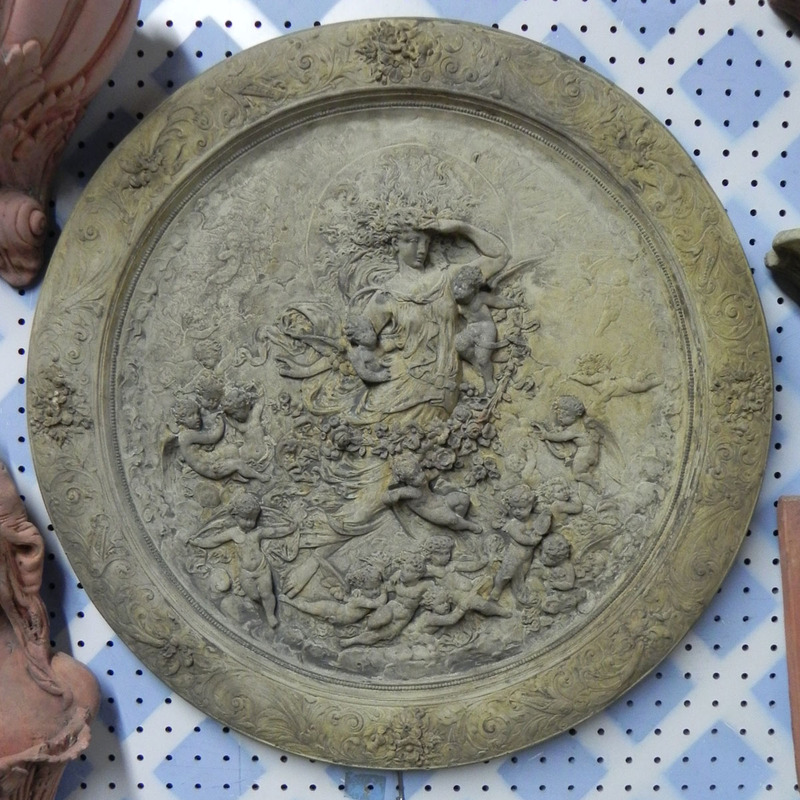 Authentic antiqued terracotta finish cherub holding fruit wall plaque. A galvanized hook is set in the back for hanging. Designed & Made in England. Manufactured from carefully selected materials to ensure weather & frost proof durability. 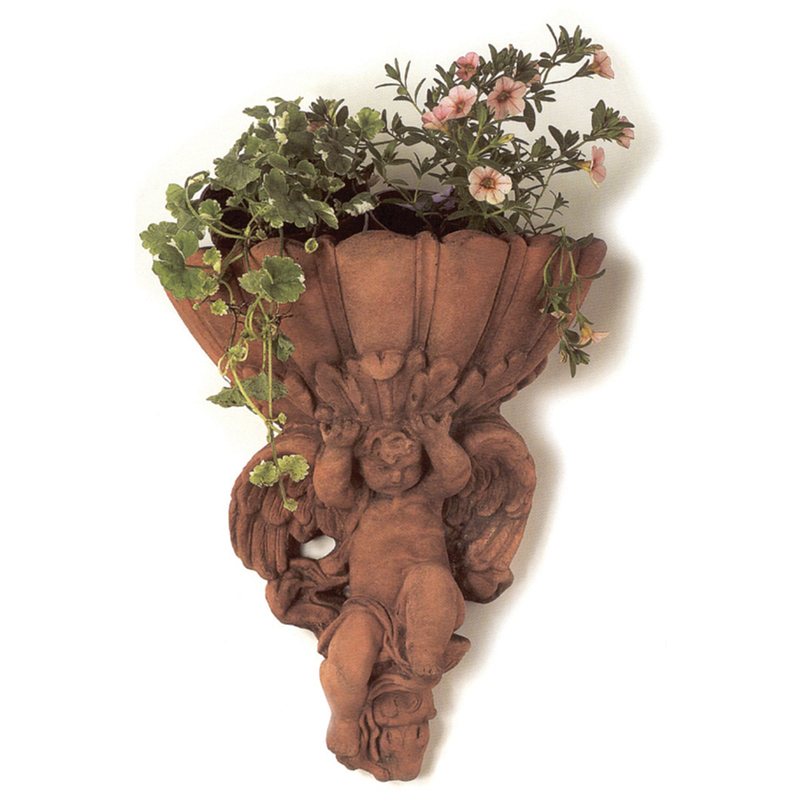 White terracotta finish cherub with wings wall planter. Planter has 2 holes in the back, one for hanging & one for drainage. Designed & Made in England. Manufactured from carefully selected materials to ensure weather & frost proof durability. 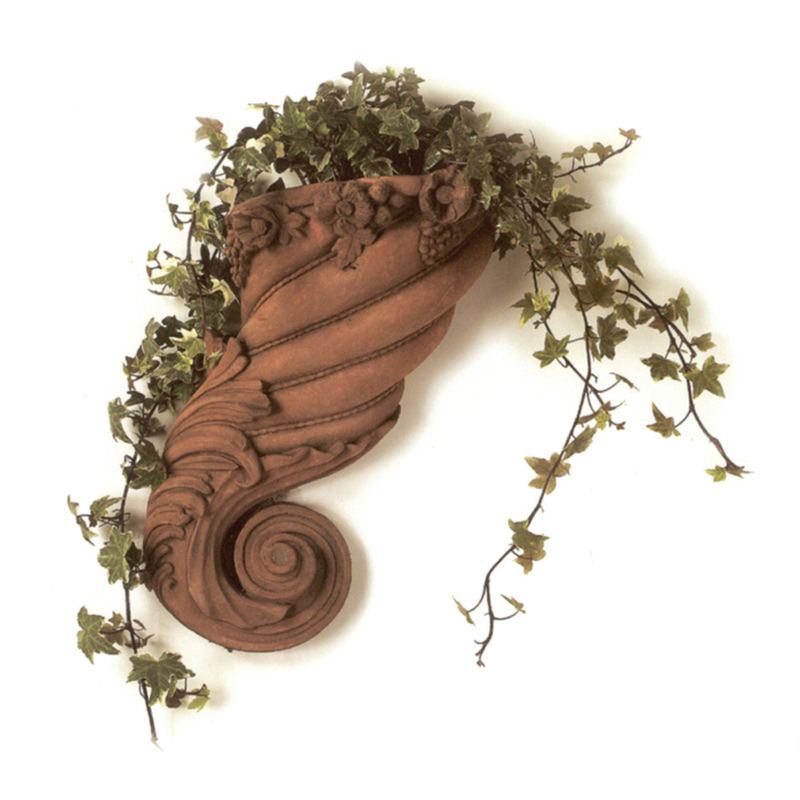 Authentic antiqued terracotta finish cornucopia wall planter. Planter has 2 holes in the back, one for hanging & one for drainage. Designed & Made in England. Manufactured from carefully selected materials to ensure weather & frost proof durability. 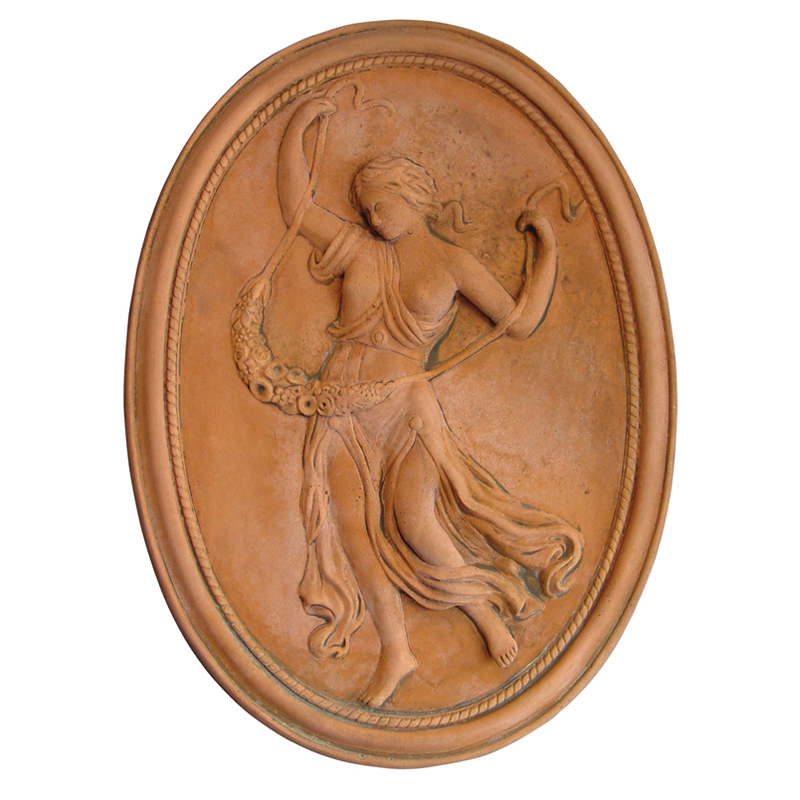 Authentic antiqued terracotta finish dancing lady plaque. A galvanized hook is set in the back for hanging. Designed & Made in England. Manufactured from carefully selected materials to ensure weather & frost proof durability. Authentic antique terracotta finish horn of plenty urn. Designed & Made in England. Manufactured from carefully selected materials to ensure weather & frost proof durability. 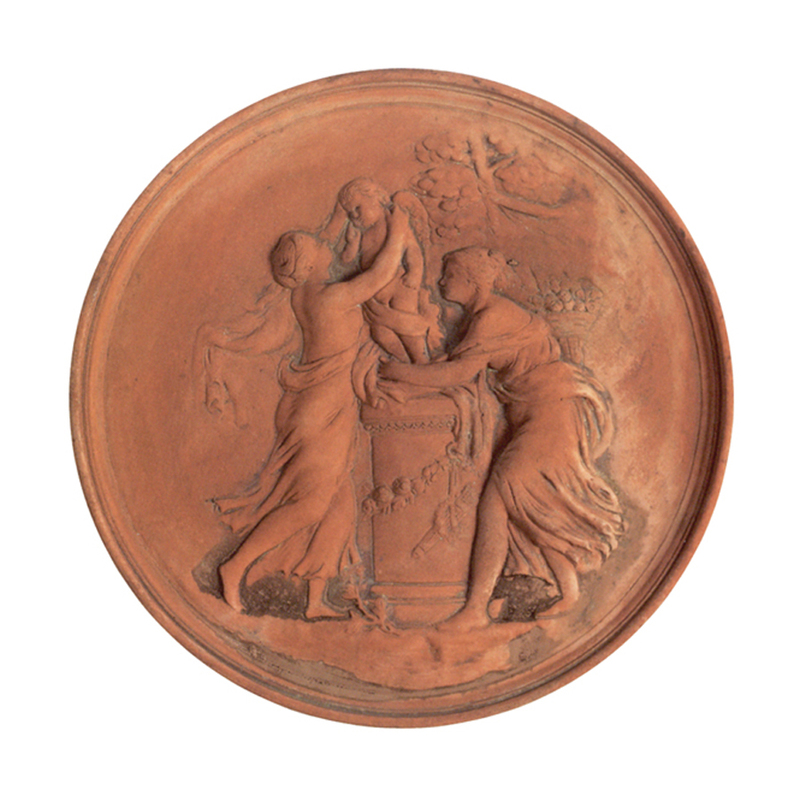 Authentic antique terracotta finish ladies with cherub wall plaque. A galvanized hook is set in the back for hanging. Designed & Made in England. Manufactured from carefully selected materials to ensure weather & frost proof durability. 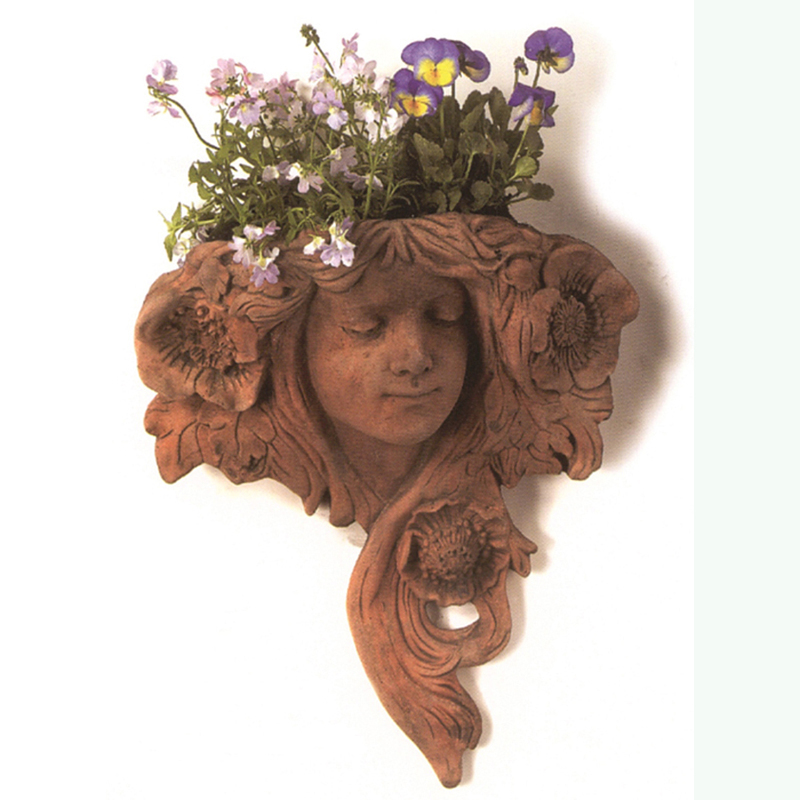 Authentic antiqued terracotta finish Lady leaf wall planter. Planter has 2 holes in the back, one for hanging & one for drainage. Designed & Made in England. Manufactured from carefully selected materials to ensure weather & frost proof durability. 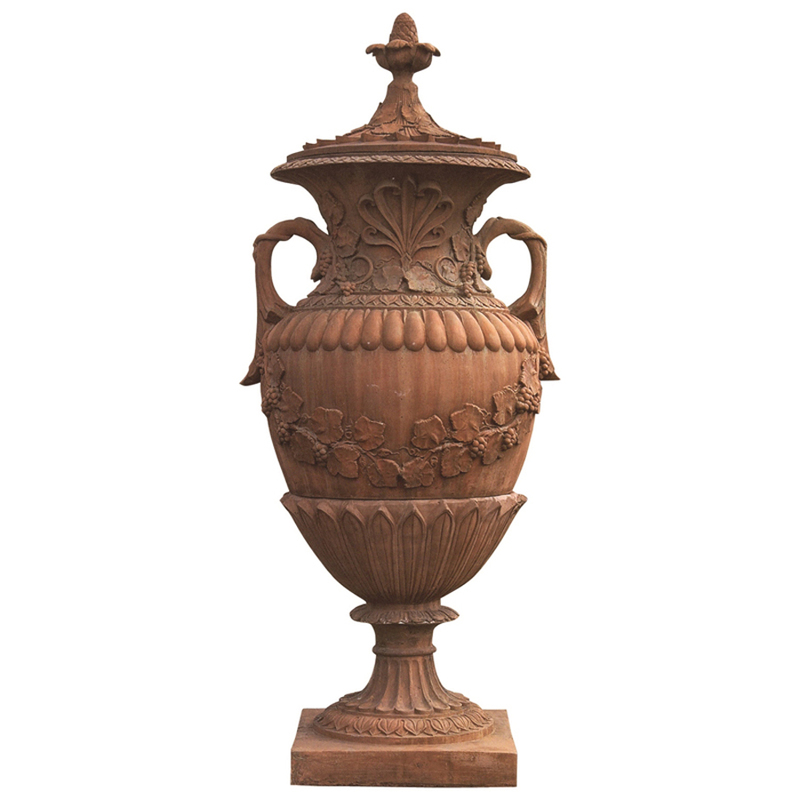 Authentic antique terracotta finish large Stanley urn. Designed & Made in England. Manufactured from carefully selected materials to ensure weather & frost proof durability. 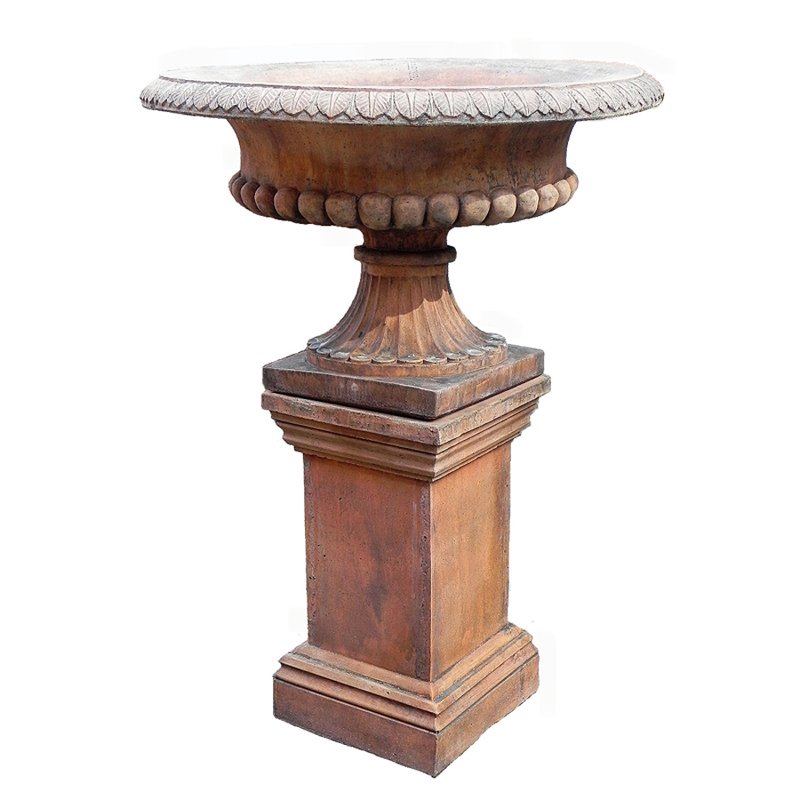 Authentic antique terracotta finish large pedestal. Designed & Made in England. Manufactured from carefully selected materials to ensure weather & frost proof durability. 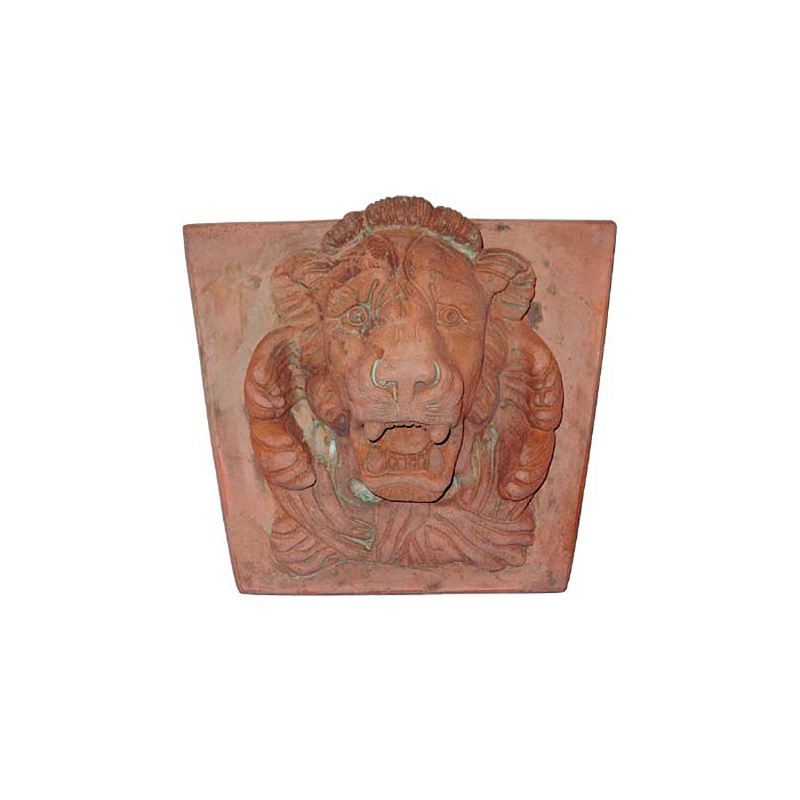 Authentic antiqued terracotta finish lion mask fountain head. A galvanized hook is set in the back for hanging. Designed & Made in England. Manufactured from carefully selected materials to ensure weather & frost proof durability. White terracotta finish pipe player wall plaque (finish shown not available). A galvanized hook is set in the back for hanging. Designed & Made in England. Manufactured from carefully selected materials to ensure weather & frost proof durability. 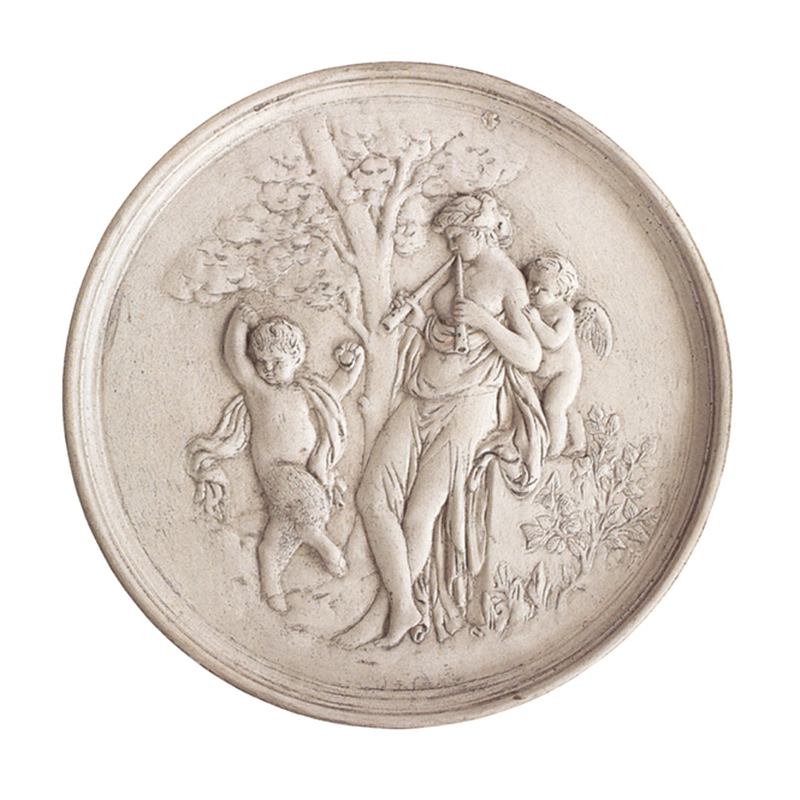 Cotswold finish round 100 cherub plaque. A galvanized hook is set in the back for hanging. Designed & Made in England. Manufactured from carefully selected materials to ensure weather & frost proof durability. 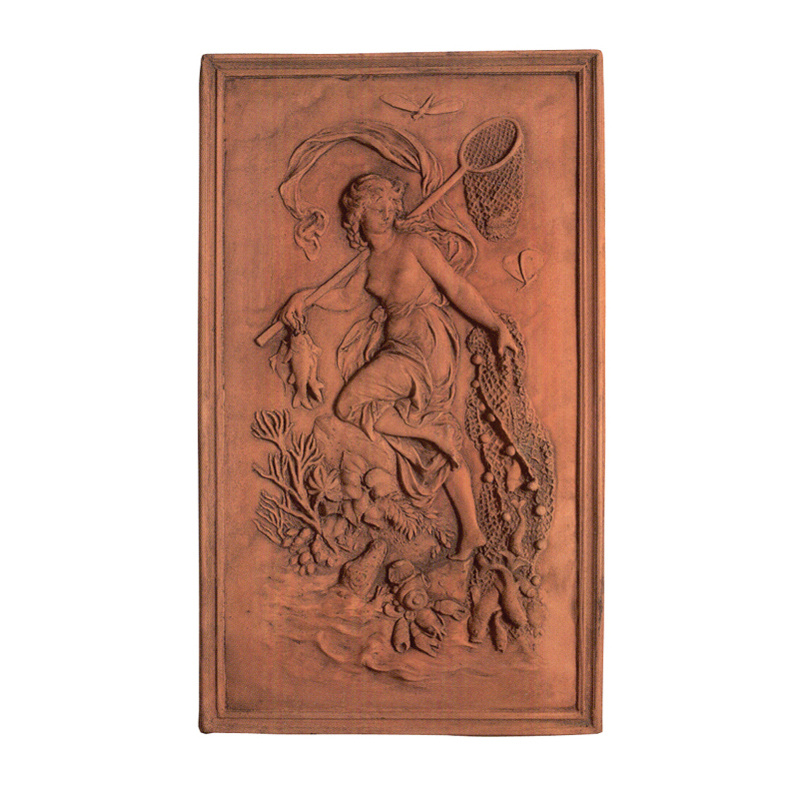 Authentic antiqued terracotta finish fishing lady wall plaque. A galvanized hook is set in the back for hanging. Designed & Made in England. Manufactured from carefully selected materials to ensure weather & frost proof durability. 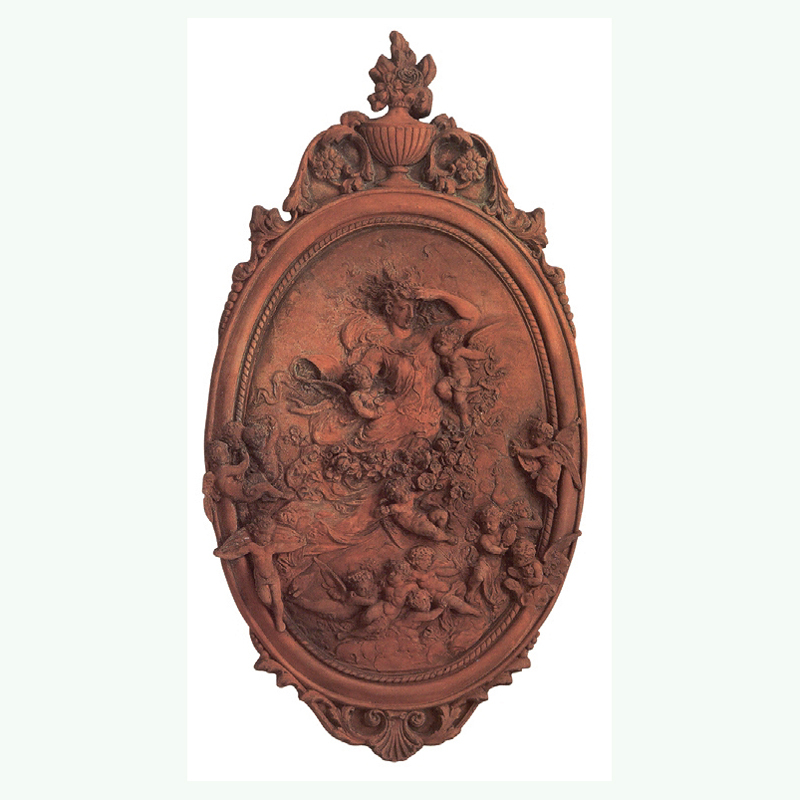 Authentic antiqued terracotta finish oval 100 cherub plaque. A galvanized hook is set in the back for hanging. Designed & Made in England. Manufactured from carefully selected materials to ensure weather & frost proof durability. Authentic antique terracotta finish small basket weave urn. Designed & Made in England. Manufactured from carefully selected materials to ensure weather & frost proof durability. 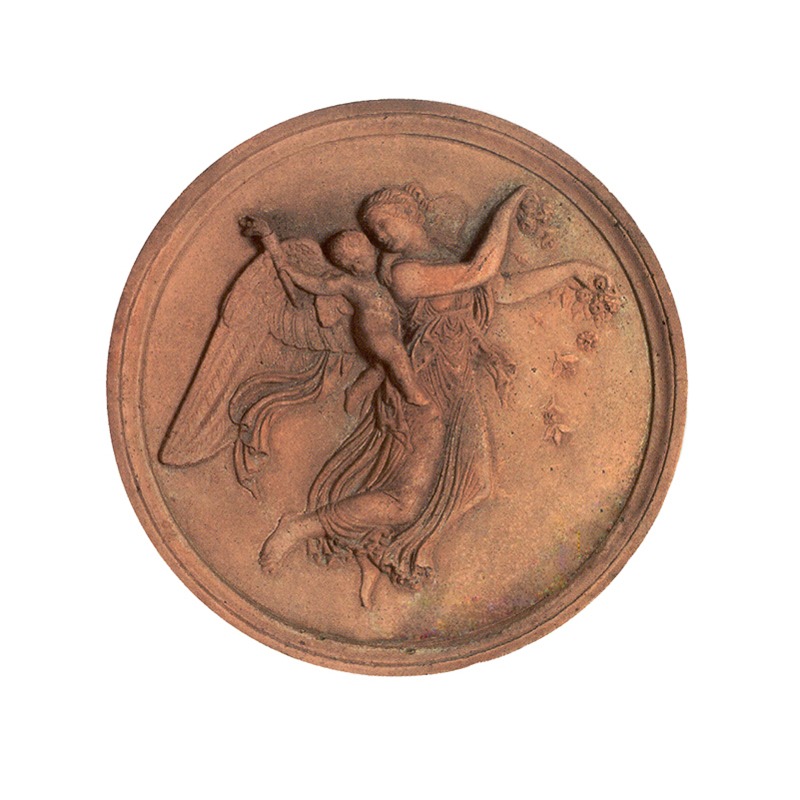 Authentic antiqued terracotta finish small round day plaque. A galvanized hook is set in the back for hanging. Designed & Made in England. Manufactured from carefully selected materials to ensure weather & frost proof durability. 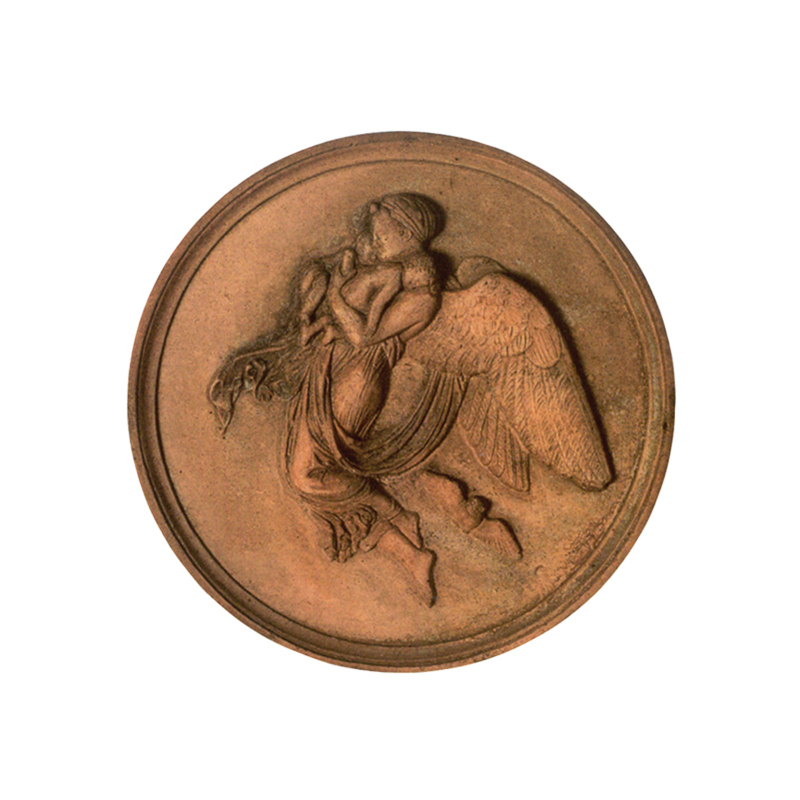 Authentic antiqued terracotta finish small round night plaque. A galvanized hook is set in the back for hanging. Designed & Made in England. Manufactured from carefully selected materials to ensure weather & frost proof durability. Authentic antique terracotta finish square Basket weave Urn. Designed & Made in England. Manufactured from carefully selected materials to ensure weather & frost proof durability. 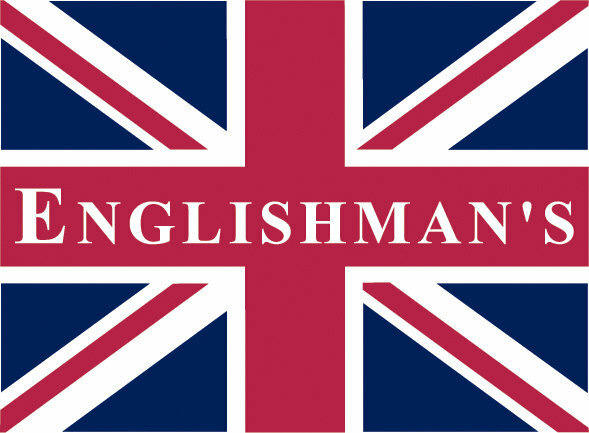 Englishman’s has been the supplier of quality English & European furniture for over 20 years. Family owned & operated, with more than 20,000 sq ft of product and the ability to custom build furniture, Englishman’s is one of the best resources when you are looking for furniture.